Bogaz Hotel is located in the entrance of Karpaz Peninsula surrounded by beautiful locality and has a good history. It is just 30 minutes from airport and the city center is reachable within 15 minutes. The hotel is surrounded by Mountains and Mediterranean Sea, so from every room in the hotel you can enjoy the beautiful scenery. Also, the atmosphere around the hotel will make you feel like that you are staying in your own home. The hotel has a total of 60 rooms in that 8 of them are family suites, 3 for disabled and 4 of the kind non-smoking rooms. Bogaz Hotel has facilities like all other hotels. The facilities include split air conditioning, direct telephone line, satellite TV, mini bar, hair dryer, internet connection, and balcony. From balcony you can enjoy a beautiful view of mountains and the sea. 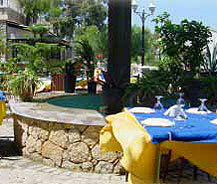 The hotel also incorporates an open-air restaurant and bar which provides customers different variety of foods and drinks. Bogaz Hotel also has a private beach called Bogaz Beach Club which has water sports and it is nearby the fishermen harbor. The hotel also arranges walking tours that many nature lovers enjoy to participate as they could have a great look at sceneries all around.